As you’re getting ready to put away your lawn mower, there are several things you should do to help your grass make it through the winter and emerge healthy next spring. • If you haven’t done a soil pH test, buy a test kit at your local garden center and use it. The results will guide the rest of your lawn care steps. • Aerate your lawn to counteract soil compaction. 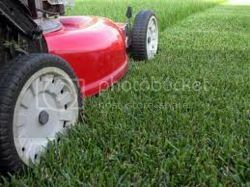 •Apply new seed that will replace dying grass. • Fertilize your lawn. Use your pH test results and the recommendations for your grass variety to determine what type of fertilizer to use. Because of our focus on making your lawn look great through sprinkler/irrigation systems and outdoor lighting, we also offer this lawn care advice, as it’s another essential component for attractive lawns. This entry was posted on Thursday, September 27th, 2012	at 8:00 am	. You can follow any responses to this entry through the RSS 2.0	feed. Both comments and pings are currently closed.